SEW is a Sorbet and Relate Enterprise Development Initiative that aims to raise funds in support of economic social responsibility campaigns across Africa. This Mother’s Month, Sorbet’s SEW Campaign is solely dedicated to Mom. 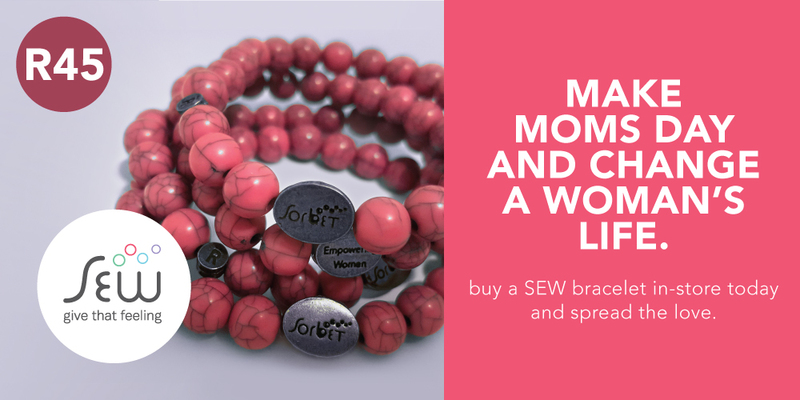 In addition to hugs and kisses, tips and toes, Sorbet Guests can now treat their Moms to a SEW Love Bracelet too, for just R45. Strung together with heart and beads, the SEW Love Bracelet is not only a tribute to the indelible marvelousness of Mom but it offers reverence to the young and old hands that have bound these beads together. By supporting SEW, you get the opportunity to empower women in South Africa to sustain their livelihood, their families and their big beautiful dreams. So go on, add a few beads to this year’s Mother’s Day presie and pass on the love from their hands to Mom’s wrist. Proceeds from SEW bracelets are donated to the Sew beaders,by the Sorbet Group. This article was pulished by Sorbet, click here to read the original.